The statistics about elder abuse tell a troubling story. About five million seniors suffer from some form of abuse, neglect, or financial exploitation each year, and older Americans lose more than $2.6 billion annually because of these crimes, according to the Administration for Community Living. In an effort to increase awareness of these threats to seniors and to help people identify and prevent cases of elder abuse, the International Network for the Prevention of Elder Abuse launched the first World Elder Abuse Awareness Day in 2006. In 2011, the United Nations officially designated June 15 for this important public awareness event. To recognize World Elder Abuse Awareness Day, the Social Security Administration (SSA) will host a Facebook Live broadcast on Wednesday, June 13, at 7 p.m. ET to discuss the detection and prevention of elder abuse. Jennifer Walker of the Office of the Inspector General (OIG) at Social Security will discuss how the OIG detects and prevents cases of suspected elder abuse and financial exploitation, and she will explain how people can identify and report suspected elder abuse, as well as how people can protect themselves or seniors they know from mistreatment. Raising awareness of elder abuse is very important to SSA and the OIG because many of SSA’s customers are seniors, and some of them depend on representative payees to receive and manage their Social Security benefits. The OIG investigates cases of representative payee fraud and misuse, which can deprive older Social Security beneficiaries of the funds and care that are essential to their welfare. The OIG also tracks and alerts the public about various theft schemes, which often target seniors, aimed at stealing money or personal information from unknowing victims. The OIG maintains a Scam Awareness page on its website to educate the public on how to identify potential schemes and protect themselves from financial exploitation and identity theft. Jennifer Walker of the OIG will discuss all of this and more during the June 13 Facebook Live broadcast. June is also World Elder Abuse Awareness Month. 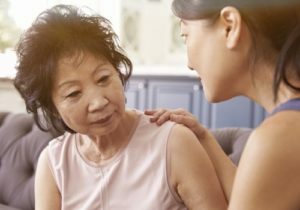 Throughout the month, government agencies, businesses, and organizations nationally sponsor events to unite communities, seniors, caregivers, governments, and the private sector to understand the importance of recognizing, understanding, and preventing mistreatment and violence against the elderly. For more information on World Elder Abuse Awareness Day, visit the National Center for Elder Abuse website. The Department of Justice also provides a wealth of information and resources online through its Elder Justice Initiative. If you suspect elder abuse, call 911 for an emergency. In a non-emergency situation, use the Eldercare Locator by calling 800-677-1116 to find your local reporting agency. Don’t Stand by … Speak Up! This entry was posted in Aging, Office of the Inspector General and tagged administration for community living, elder abuse, elder abuse awareness, Elder Justice Initiative, Facebook Live, National Center for Elder Abuse, Office of the Inspector General, scam awareness, theft schemes, world elder abuse awareness day by Andrew Cannarsa, OIG Communications Director. Bookmark the permalink. I’m scare to get abuse in my elderly lifetime now I’m 64 years old next year i will turn 65 years old and I’m poor.tomorrow is my hearing date.from social security Administration. Contact someone you trust with your concerns. It is never appropriate to put personal information on a public blog site. Can a spouse financially abuse her partner? My dad is an 86 year old man who had a stroke in 11/2017. Now has some memory issues. He is at a care facility being covered 100% by Medicaid after an initial hospitalization. The facility said he is well enough to leave and get an apartment. His 71 year old spouse (3rd wife) has never worked and they each receive SSA based on his earnings and he has a small VA benefit. She is collecting all of their combined SSA and his VA (total about $2,200 per month) providing him no money and very minimal support (a new electric razor). I, his son, have taken him out of the facility on a couple outings. But he has no money to do things with. She does not keep the money in a bank which must be over $14,000, instead she is living with her sister and sisters husband and are keeping cash in a safe. She is not doing anything toward getting a place for them to live. Note that he was a small business owner who lost his business in the Bush recession and has not worked for a couple of years and has back taxes due for several years. But she will not address those. I believe that she is waiting him out and hoarding their income until he passes. My brother and I set up a status meeting a couple of months ago to discuss my father’s status, treatment, future plans etc with the facility and social worker. His spouse refused to attend. Is there anything wrong with her refusal to allow him access to his money? Yes, this is wrong. Contact Social Security and apply to be your father’s payee. By the way, it is never appropriate to put personal information on a public blog site. You’re right Snarky. I didn’t, until I see that my name is associated with the post.. Ugh. Thanks. I did not think that I put any on, until I saw that my name was posted in association with the post. Did not think of that. Yes, I need to get a social security card. I tried to apply for one on the ssn website, but couldn’t get through. Can you provide me detail instructions on how to get a replacen ss card? Hi!I was a victim! Iam 76 yrs old. Scamed. Hached. Stole. Since October!! On going. Court . the state of Fl. Been fighting for my money. I feel like the. One who did this. It is a awful. Feeling. You don’t want to go on. He killed my dog!he is in jail. I got brain washed. It came to about$7000? Contact someone or an agency that you trust with your concerns. It is never appropriate to put personal information on a public blog site. It is very important that raising awareness of elder abuse should not be the only medium afforded, but should constitute education much earlier in and with our Nation servicing institutions. From manual labor to the industrial revolution to our service economy and through our age of information/ technology revolution, elder abuse has been in the shadows too long. Legislation is very essential in improving the way the Nation view this type of abuse as any other abuse and the way we all can collaborate to eradicate it , however, we need much more now. The cost of money and the loss of monies are indicators of a very ever increasing threat in and to our families, neighborhoods, institutions, cities and the very fabric of our Nation, not to mention Nursing homes abuses. The product of this behavior can only lead to continue deterioration and fragmentation of our strongest agent in and of our society, “The Family”. Awareness and education about these threats to seniors should take the forefront now, as we all may be there during our living. I recommend the creation of a task force through each and by every service institutions that deals directly with the provision of services to seniors. This can be achieved via education, social service and medical care. After all, “The fruits of our labor” may just turned out to be just a phrase. The core of this initiative should be designed with the mindset for Education, Detection and Prevention that could lead to prosecution. EDP should become the model for any type of abuse at any level in our society. What does one do when they are aware of this? Contact someone you trust or perhaps a senior service agency with your concerns. It is never appropriate to put personal information on a public blog site. Hi Linda! The Social Security Administration (SSA) will host a Facebook Live broadcast on Wednesday, June 13, at 7 p.m. ET to discuss the detection and prevention of elder abuse. Jennifer Walker of the Office of the Inspector General (OIG) at Social Security will discuss how the OIG detects and prevents cases of suspected elder abuse and financial exploitation, and she will explain how people can identify and report suspected elder abuse, as well as how people can protect themselves or seniors they know from mistreatment. I take care of someone who is 95 yrs old. He has been my mentor and father figure for almost 50 yrs. There is nobody in the world that I love more than he. I notice long ago how vulnerable he is; mentally and physically. We all have an obligation to look after our loved ones. I hope that he stays in this world, near me, for more than a couple of years. I pray to God to give me strength to be able to help him. For monetary elder abuse, I think the key is awareness when you still have a sound mind, combined with gaining a trust relationship early in the “older years”, with a sound mind, with someone who has a fiduciary responsibility for others’ assets (like a professional fiduciary) and gaining a covenant relationship with them to never act by yourself on financial decisions at the time of dementia, etc. set-in. I am single, no children, youngest sibling, a scenario which will leave me with no blood relations if it plays out normally. I recently educated myself on professional fiduciaries roles in one’s life, and for me, this seems like the best route for my retirement future in the years ahead. e-mail address is incorrect ( first time noted today). If this is MOST important the correct address is jawarth132@gmail.com. Thank you. Hello John, for assistance with your “my Social Security” account, please call our dedicated my Social Security-Hotline. To reach this hotline, call 1-800-772-1213 (TTY 1-800-325-0778), Monday through Friday from 7 a.m. to 7 p.m. At the voice prompt, say “helpdesk”. Or contact your local Social Security office directly. Thanks! Informative article! Issue is very important to protect Elderly! Thank you! Your thoughts are important to us and we’re pleased when feedback is positive. We try hard to provide the best possible service to our customers and your satisfaction is our reward. Be careful when called by someone saying they have grant money you have been awarded and you don’t have to pay it back. I thought I could not get caught by these scam artists but I was. The took 850.00 from me. Later when I was thinking these people knew I was on social security, how do they get this list? These callers are from India with Indian accents they are still calling me and harassing me. Please visit the Federal Trade Commission – Consumer Information web page for important information on this topic. Thanks! Do you have an e-mail address I can send a concern to with a copy of a probable problem relating to social security. I want to forward the contact I received. Hello Fred! To submit your comment, complaint or suggestion, you can write to us or send us an email message. Thanks. Elder Abuse is, most of the time, an offspring of a kind of discrimination. The perpetrators know themselves and discuss their art with themselves. The most common type of Elder Abuse are from government officials who knowingly disobey the laws and rules of this nation, and fail woefully to toe the lines of sanity because of their hatred of those that they consider different from them. Unfortunately this attitude has been going on for so long that it has become the cancer warm of this nation. It appears that no amount of seminars or lectures or campaign can change the system because the group that perpetrates this heinous crime are at the head of the nation affairs. So if you advise them about the correct ways of doing things, you will find yourself in jeopardy because you’re considered an outsider. Elder Abuse is a common occurrence in this country, you like it or not and it’s not going anywhere as long as racism is being keenly worshiped everywhere. This morning i want to my hearing finally I’m feeling because i have opportunities to with the judge about mental illness why i can’t work from along years i am been suffering with major depression.now i am 64 years old soon I’ll be 65 years old.i hope i will get a better life. It may be very difficult if not impossible to eradicate or even reduce the incidence of Elder Abuse without tackling the root cause of ABUSE generally in this country. Elder Abuse is an abuse perpetrated only on the elderly persons. It is an extension of the culture of ABUSE that is being commonly leashed on some groups of people since they come to this . The only way to tackle Elder Abuse effectively is to deal with ABUSE generally so that it does not become a culture that every body knows it to be now a days. With a culture of abuse, majority of the people of this country do not consider it a bad thing as long as they are in a position to unleash it on other people or groups. One step of dealing with all types of abuse is to stop the unnecessary grouping of people into ethnicity. Immediately some people know your ethnicity, they are ready to deny you your entitlements knowing truly well that they are in position to ‘do and undo’, and you are incapable of altering what they did, knowing that the next level of authority is one of them who also admire and cherish abusive and discriminatory treatments and therefore you can’t do anything whatsoever. As a result of concentration of power in the hands of certain ethnic group, the incidence of ABUSE including Elder Abuse will continue to grow and will be difficult, if not impossible to solve. However a trial is not bad. I wish you well in this journey. Incidentally or paradoxically the World Elder Abuse Awareness Day, June 15 is the anniversary of my 71st birth day. But unfortunately this month will be 25th month since my retirement benefit has been kept under lock and key by the authority responsible to disperse retirement benefits to retired elders of this nation. The reason for this punitive measure was because I have no bank account. I know many people in this country who get their retirement checks from Currency Exchange locations, and there is no law or rule which prohibit government agencies from sending benefits checks directly to the address where you live. I received the last payment in May 2016. I had begged for mercy without any change of heart from Almighty SSA. My SSi benefit also suffered the same faith as my retirement benefit. This, no doubt is a classical form of Elder Abuse. At 70 years of age the officials of Social Security Administration should be a little more humane and considerate to me knowing very well that without the benefits life will be difficult especially in a city like Chicago. I hope the awareness discussion will open some powerful people ‘ minds to be considerate to elders any where in the world. I am very positive some elders will immensely benefit from the World Awareness talk. Unfortunately, but for security reasons, we do not have access to personal records in this blog. However, we can inform you that a new law went into effect in March 2013. The Treasury Department requires federal benefit payments to be made electronically. Please continue working with your local office. If you are unable to visit the local office, you can call our toll free number at 1-800-772-1213, representatives are available Monday through Friday, between 7 a.m. and 7 p.m. Thanks! I thank you for your response to my revelation above. But I am hesitant to accept the information you stated that The Treasury Department requires federal benefit payments to be made electronically in 2013, because in June 2015 SSA sent a check of $4,159.00 to me in my present address. The payment was delayed for 16 months because of elder abuse due to what has been discussed above. If you are correct what is wrong for SSA to educate the public instead of just keeping silent. SSA’s responsibility to the people of this country is to assist them to be able to live well, not to punish them. When benefits are delayed for over two years, then this certainly an abusive treatment of the elderly. The responsibility of stopping Elder Abuse should not fall on the affected elders but on all of us, we should jointly protect the vulnerable elders from cruel attitude of some ignorant officials or else the unfortunate elders would just die from crudity of immense proportion. The purpose of the World Elder Abuse Day is to protect the elders by making certain that Treasury Department or any other agencies of government avoid all instructions that can negatively impart elders, and ensure that they’re informed about all rules that can negatively impact elders, and to ensure that they are properly informed. Cyber stalking/ cyber bullying is the one that I’m saying seems to follow from city to city. And all the other stuff put together as a result of after the may 28 2018 accident !!!! lawyer/ possible settlement and now ssi disability. Just wanting to make sure I properly word it. I searched for information: How to order a replacement SS Card. the search returned Eldwer Abuse. How do I order a replacement SS Card? Hello Michael, please go to “How do I apply for a new or replacement Social Security number card?” for complete information. Thanks! I searched for information: How to order a replacement SS Card. The search returned Elder Abuse. You must have confused me with your thousands of other citizens who have made a similar comment. I don’t recall ever making this comment before. Hello Michael, please visit our Frequently Asked Questions web page on “How do I apply for a new or replacement Social Security number card?“, thanks!